Thanks to ContextMedia, a beautiful 32" flat-screen television has a new home - on the wall at Cabrini Connections! Chicago-based ContextMedia builds waiting room TV networks that empower healthcare professionals to educate and inspire their patients as they make critical decisions about their lifestyle and clinical treatment. At Cabrini Connections, they have empowered us to educate and inspire over 70 students and 85 volunteers who come to our center on a weekly basis. Everyone has been impressed by the TV so far (lots of oooh's and aaah's) as we have already started to stream announcements. 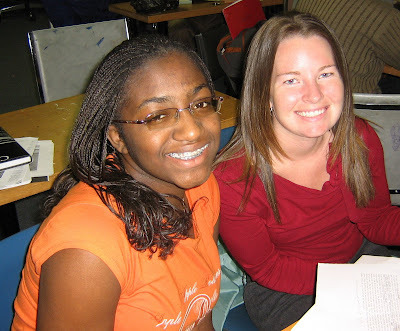 This is just one example of how a business can step up to help a tutor/mentor program. Leaders in sectors of education, finance, technology, etc. should be looking for ways to pair their assets with needy nonprofits. A simple donation such as this can lead to a long-term relationship. Until more corporations and businesses make pledges to support tutor/mentor programs like Cabrini Connections, we will continue to struggle each year to keep our doors open. If you are interested in learning more about business involvement, I encourage you to read some of these articles on Tutor/Mentor Blog. Thanks! After college, Sue moved to New York City which marked the culmination of her big city dreams. She worked as a prop and wardrobe stylist for commercial photographers. “What makes New York neat is that people sort of live their lives on the street,” she says. Sue did a lot of walking to soak everything up. “I love the different neighborhoods… [New York] is very tall but very small… every second is exciting.” Her passion for the city comes through clear as she talks about it; makes me want to go right now! Sue discovered Cabrini Connections online while searching for opportunities to volunteer. College Zone Coordinators Stephanie Rogers and Carla Reyes helped her get acclimated in the fall, so now she’s pretty comfortable with the routine. “I love it,” she says. “It is really helpful for [the students] to talk to somebody who can sit with them and go back and forth [about the application process. ]” There are a broad range of possibilities and Sue hopes to expand the bank of choices they think they have. Thanks for all you do, Sue! We are happy to have you as part of the team. As Imann nears the college application process, one of her biggest requirements is a warm climate. She would like to live in Atlanta, Miami, or anywhere in California. Her top choices for schools include historically black colleges and universities such as Spelman and Clark Atlanta. She has always lived in Chicago – a city she loves – but she is excited to move away and experience a new setting. She visited her sister, who goes to Savannah College of Art and Design in Savannah, Georgia, and loved it. One of Imann’s short term goals is to apply to People to People Student Ambassador Programs. She has never been out of the country and would love to do some exploring. Her long term goal is to become a dermatologist because of her interest in skin and skin problems. Lastly, one of her general goals is to assume more independence. She hopes to move out and pay her own bills by age 22. Imann has one sister, three brothers, and she would like to give a special shoutout to her nephew, Cameron. “I love you!” We love you, too, Imann. Thanks for being a great ambassador for our program. For more information about Cabrini Madness, click here. 13 teams are looking for support. Who will you root for/donate to? Writing Club Coordinator Shannyn Nellett (left) grew up on a farm in Ohio where she learned to see the simple side of life. Her family didn’t go out to eat – everything was homemade. They picked vegetables from their own garden and went to country markets for proteins. They didn’t have a computer or cable television, so Shannyn and her sisters were forced to entertain each other. Their entire lifestyle was very frugal and self-sufficient. When it came time for college, Shannyn took a train out to California to study comparative literature at San Diego State University. She was in for an extreme culture shock, but instead of being afraid, she was completely fascinated. The biggest difference was that people in California are very self-interested, whereas people in her hometown are more concerned with taking care of others. But, different as they may be, she managed to have a good time. After college, Shannyn worked on the east coast for awhile before moving to Chicago. She wanted to make a big change after originally taking a job as an account manager. Now she works as a freelance writer and artist. She also works at restaurants near Wrigley Field when the Cubs are in-season. She loves Chicago because it is so diverse and there is so much to see and do. Her favorite place in the entire world is Barnes & Noble. She does most of her writing there and jokes that it’s her office. Shannyn heard about Cabrini Connections through a friend who wanted to implement a writing program at a tutor/mentor center. On their first day here, they came in with brownies to meet students and tell them about a new writing club. The next week, they brought journals, stickers, and markers, and it was a hit! Shannyn wrote a message in each student’s journal to express appreciation, and, for about a year, they had 10 students every week. Numbers have been a bit lower this year, but the club has carried on. Anyone is welcome to join at any time. 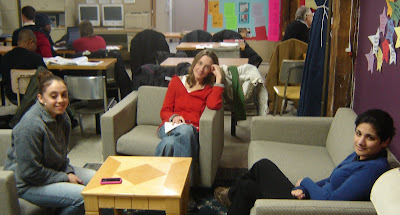 Writing Club is for students who enjoy expressing themselves or want to improve their writing skills. (It’s also important to note that they bring food, such as Subway or McDonald’s.) You can see what they’ve been working on on their blog and their Facebook group. Shannyn’s personal goals for 2010 and beyond are 1) to get published, 2) to get a master’s degree, and 3) to learn more about photography. Good luck with your goals, Shannyn, and thanks for all that you do! 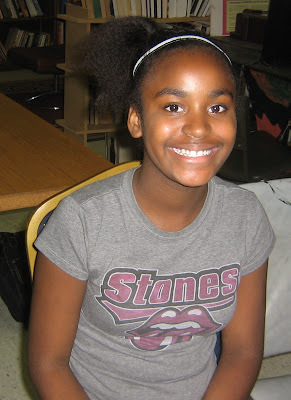 Senior Brittany Delaney lives on the west side and attends Al Raby High School. Her favorite subject is Spanish because it’s easy to pick up. She loves roller skating, cheerleading, and (like any high school girl should) shopping. In addition to being a good student and recruiter for our program, Brittany is in the spotlight this week because she has decided to attend Eastern Illinois University in Charleston, IL. Congratulations! EIU is 3-4 hours from Chicago which excites Brittany because it gives her a chance to grow more independent. “I look forward to having fun and managing my time,” she says. “…and to finding new friends to start relationships with.” A lot of graduates from Al Raby go to SIU or NIU, but Brittany purposely wants to try something different. “I’m excited but nervous at the same time,” she says. Brittany plans to pursue social work as a career, which may require graduate work, so for now she will study a related field such as education. “[Social work] is a field that needs more growth,” she says, “especially in our community,” and this is a way to give back. Social workers work in places like schools, hospitals, and community organizations, which makes her a prime candidate for many positions. Brittany’s goal for 2010 is to have fun while she’s still in Chicago. She wants to make the best of these last few months before everyone goes their separate ways; and then she has to get ready for college! It’s a big year for Brittany, but we’re confident she can handle it. Best wishes! To help promote Cabrini Madness and energize the teams, we will create a new sports-themed viral video each week. In this, the first episode, Loyola intern E Wilson interviews Tim Minton and Jessica Newberg, coaches of the #1 team, Team Impeccable. 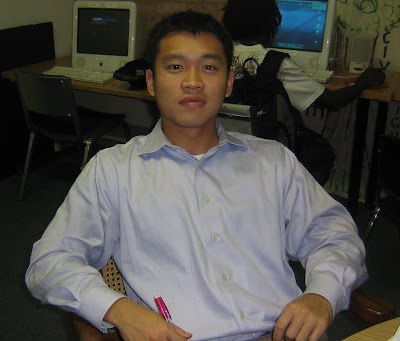 Second year mentor Sean Liu is from a lot of places – Kentucky, Philadelphia, Michigan, Connecticut, North Carolina – but Chicago feels like home because he’s been here for eight years. Sean went to high school in the north suburbs and he went to University of Illinois for his undergraduate degree in electrical engineering. Sean lived in a dorm for three of four years in college and he played a lot of basketball (his favorite sport). There was a gym right across the street where he spent about 12 hours per week playing pick-up games. After graduating in 2006, Sean went to University of North Carolina for a Master of Accounting graduate degree. He says he loved it there, the teachers are amazing, and it was more enjoyable than his time at U of I. He recommends accounting “if you like understanding how business works” or if you’re interested in entrepreneurship or the stock market. He recommends North Carolina because the weather is great, there are hills, and you’re close to the beach. Now, Sean does financial analysis for Hyatt Corporation. On a typical day, he analyzes financial data and highlights important variances, such as significant drops or increases in revenue. He can determine if they are situational (e.g. a spike in Washington, D.C., for inauguration weekend) or caused by something else. In five years, Sean hopes to be a manager or back in school pursuing a master’s degree in business administration. In ten years, he’s interested in teaching high school calculus or statistics. Sean heard about Cabrini Connections through former volunteer Tammy Baird. On Thursday nights, he works with Gary Wise, who he met more than a year ago. “I love the program,” he says. “It keeps me in perspective… what it’s like to live in the world he lives in.” It also gives him unique insight into schools. He gets a sense of how good or bad they are based on feedback from students. To get to know your mentee better, Sean says “ask questions” and “meet outside of the program.” He and Gary have been to movies, meals, museums, and more. Congratulations on a successful relationship, and for being in the spotlight. You deserve it! 9th grader Juan Zamudio attends Noble Street College Prep, Founding Campus of Noble Street Charter School. His favorite class is physics in which he recently learned how to calculate acceleration and velocity. The hardest part about high school, he says, is to be a freshman. “You have to catch up to everybody else. You’re the smallest one.” He combats that by participating in a lot of school activities – his favorite is soccer; he plays defense for Noble’s varsity team. His favorite club is Real Madrid and his favorite player is Cristiano Ronaldo. Since Juan attends a college preparatory school, naturally, he is already starting to think about where he will go next. In sixth grade, he visited University of Wisconsin-Madison and thoroughly enjoyed it. He also thinks well of Lake Forest College which is where his sister will attend next year. No matter where he ends up, Juan plans to prepare by getting good grades and joining the National Honor Society. You can do it, Juan! 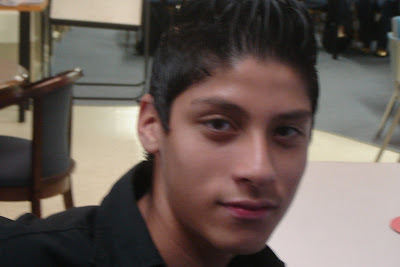 Once in college, Juan would like to study in preparation for his dream job – architect. “I like designing things and drawing,” he says,”… I want to design a building that has my name in it.” He’s not the only aspiring architect at Cabrini Connections. Israel Dosie has similar dreams, and they’re on the same Cabrini Madness team (“The Green Team”). Perhaps they will find a way to put their design skills to use. Juan joined Cabrini Connections last year after hearing about our program from his sister. He and his mentor, Charlie Megan, meet on Wednesday nights and primarily work on math. “Charlie teaches me different methods to remember things,” he says. “He makes it simple.” Thinking back to when they first met, one thing sticks out that helped them get to know each other – a trip to McDonald’s! For 2010, Juan’s resolution is simply “to have fun.” We hope you have a lot of fun at Cabrini Connections, Juan. Congratulations on being in the spotlight! This graph shows fall quarter student attendance at Cabrini Connections from 2000 through 2009. Average attendance for the decade was 80.1%. The break you see is for the week of Thanksgiving when there is no tutoring. In the coming weeks and months, I plan to create more charts like this to illustrate our impact. Visit Chicago Youth Programs for a good example of tracking outcomes. Cabrini Connections keeps data on student and volunteer attendance and retention, grades, post-secondary education plans, and demographic information like age, gender, and ethnicity. We tell stories about our program all the time to emphasize its importance, but if we can back those stories up with data to demonstrate impact and improvement, we can make a better case to donors. These charts are also internally valuable. In the graph above, you can see a downward trend from the first week (91%) to the last week (76%). Why does attendance decrease over the course of fall quarter? What can Cabrini Connections and other tutor/mentor programs do to reverse this trend? These are questions I want to begin a dialogue around. A lot of research has been done regarding volunteer retention from year to year, but what about student retention from week to week? If you have any thoughts on this matter, or if you can connect me to people asking similar questions, please post a comment. Thank you! UPDATE: Yesterday I presented fall quarter student attendance for the 2000s. Today I present volunteer attendance (below). Average attendance for the decade was 77.0% and, as with students, you can see a downward trend over the course of the quarter. One reason this may occur is because volunteers are not fully prepared. Their involvement in our program includes coaching, training, and peer mentoring, but it also involves the learning which a volunteer can do on his or her own to build skills as a tutor/mentor. However, despite this postulation, this trend could largely be the result of a rotation in a small percentage of our volunteer base. Volunteers who fall out in the first few weeks and months could bring these numbers down. I suspect that volunteers enrolled in our program for at least three, six, or 12 months have better overall attendance numbers. I will include test this hypothesis in future analyses. Brittney Swan was born in Monticello, a small town in central Illinois. She went to high school with about 500 people – just over 100 in her graduating class – and everyone knew each other… and each other’s business. For college, she went to University of Illinois at Urbana-Champaign, but while she was among more than 30,000 undergraduates, it still felt like a small community. Brittney did a lot of community service and was heavily involved with her sorority, Delta Delta Delta. She was their philanthropy chair and she started her own Greek community service organization. She majored in Agricultural and Consumer Economics with a concentration in Financial Planning. Brittney says she learned useful information for life about mortgages, insurance, estate taxes, how to do her own taxes, and more. 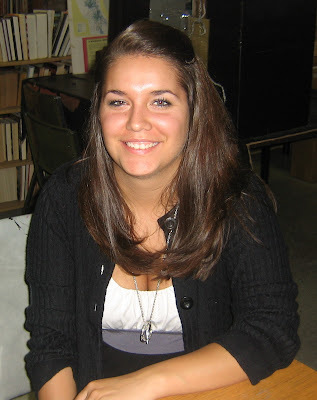 After graduating in May 2009, Brittney moved to Chicago to work for an insurance technology company named Norvax. She works to sell their technology, such as a quote engine for health insurance, to insurance carriers. About 100 people work at Norvax and she found this position through the U of I alumni network, Always Illinois. Brittney likes Chicago and plans to stay here for a while. “At home you have to drive to do things,” she says, “but in Chicago, there’s always something to do.” She’s far enough away from her hometown to grow up on her own, but still close enough to go home when she wants or needs to. Thanks for sharing with us, Brittney. We are happy to have you in the program and we look forward to continued success from you and Amari. 7th grader Amari Roby attends Newberry Academy in the Lincoln Park neighborhood of Chicago. Her favorite subjects are “math, social studies, writing… all of them!” Right now her biggest assignment is a project for the history fair. She chose to research Rosa Parks in recognition of Black History Month. “She was a brave woman,” says Amari. After elementary school, Amari would like to attend Holy Trinity High School, a co-educational, Catholic high school on the Near-North Side. She is most intrigued by their requirement to wear uniforms. “I like trying new things,” says Amari. She recently learned how to ride a bike and how to dance. For post-secondary school, Amari would like to stay in Chicago and go to Robert Morris University or Malcolm X College. She wants to become a pediatrician and/or an actress. “I love working with children,” says Amari. “I want to help other kids who are sick.” If she becomes an actress, she’s prepared to take on any role – horror, comedy, romance, anything. One of her favorite movies, Be Cool, is about a girl who wants to become a singer. She sings but the world doesn’t hear her. Amari’s dream is to “make everyone know me and see who I am.” Being featured in the spotlight is a good start! Eventually, Amari might move to Los Angeles or Las Vegas, but for now she is happy in Chicago. She looks forward to summertime when she will celebrate her 13th birthday on June 23rd. We look forward to it as well, and to many successful years at Cabrini Connections. Thanks for joining us, Amari!